Pad Thai may very well be the most recognized and popular Thai dish, but it’s the boat noodles that spark arguments between Angelenos over which restaurant serves the best version. 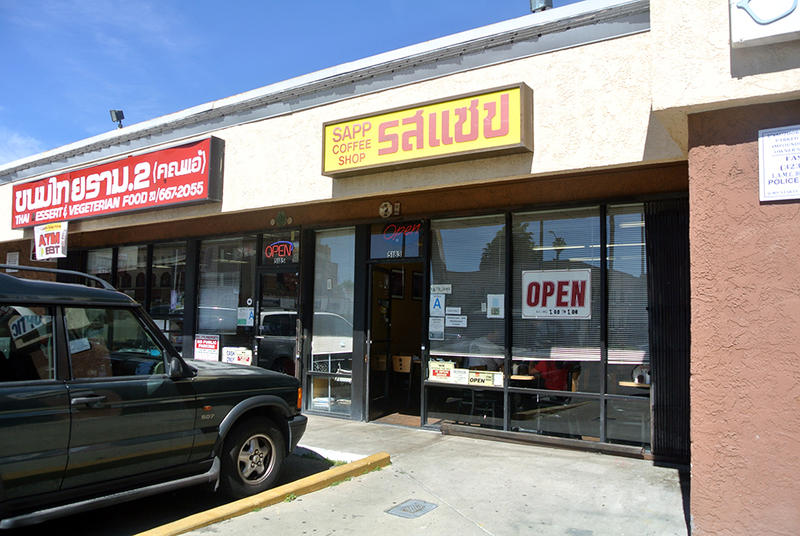 Sapp Coffee Shop is one place that always comes up in the conversation, a small family-run coffee shop/diner located in the corner of a faded strip mall on Hollywood Blvd and Kingsley in Thai town (the stretch of Hollywood between Western and Normandie). It’s far from unknown thanks to praise from the likes of Jonathan Gold and Anthony Bourdain among others, but their clientele remains predominantly Thai, even with Harvard & Stone and Jumbo’s Clown Room each a block away on either side. Keep in mind that Sapp is cash only (there is an ATM next door), isn’t open past 8pm, and is closed on Wednesdays. You don’t have to go all the way Thai and order the boat noodle soup with chewy bits of tripe and other “undesirables” like liver and tendon. Ordering it with just plain ol’ beef is perfectly acceptable. But know that either way, the intensely funky, sour-sweet, complex broth that tastes so damn delicious is made with blood. In fact, if you order the “special” you’ll even find a clump of coagulated blood floating in your bowl for added flavor. If you continued reading past all of the offal talk, then I can’t imagine a little blood being a deal-breaker. The rice noodles cling together at first, then slowly separate as they begin to absorb the broth. Slurp too slowly and the noodles will soften beyond enjoyability, so be swift. The chicharrones may look like mere garnish, but they do a fantastic job of absorbing the soup’s essence as if some pork-y sponge. 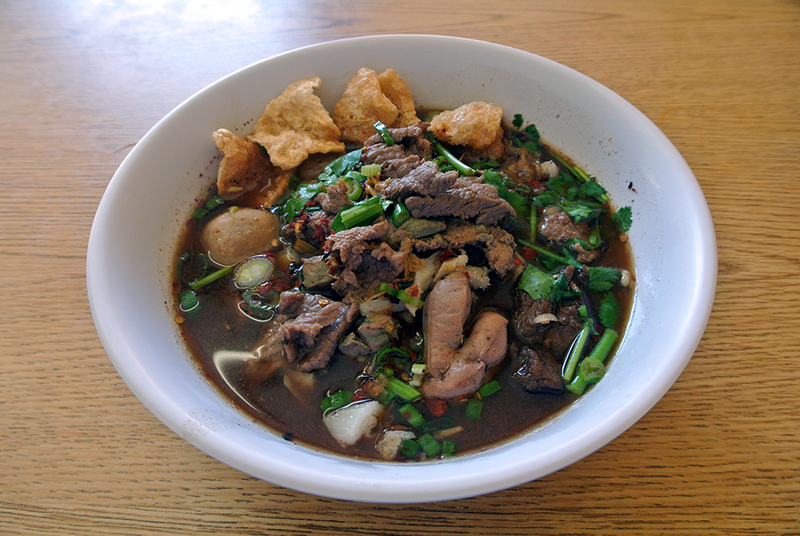 There are plenty of versions of boat noodle soup to choose from in Thai town, each with their own unique characteristics, but Sapp’s currently serves my favorite bowl. Anyone who’s eaten at Sapp more than once probably knows about their Jade noodles, a much less intimidating alternative to the boat noodles. 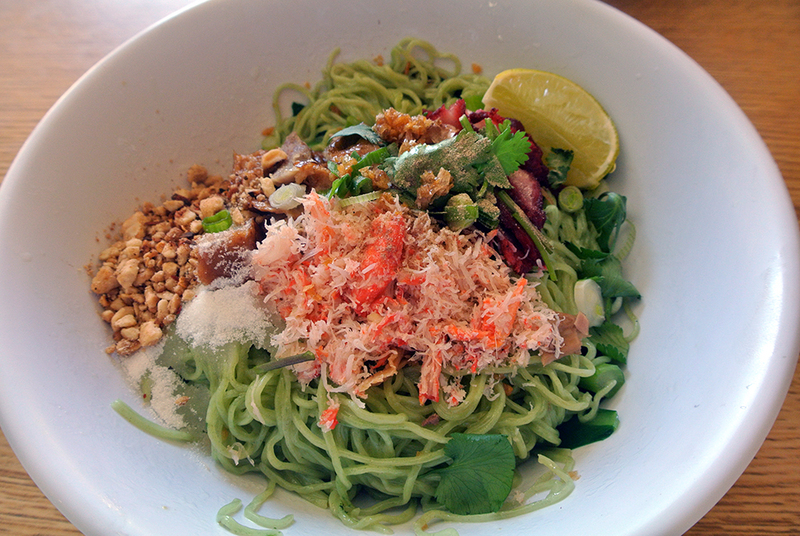 The noodles are truly a lovely sight, soft green and slicked with a bit of oil , but the real strength of this dish is the commingling of flavors once you mix together all of the colorful items and squirt some lime juice into the fray. It hits every flavor profile – spicy, sour, sweet, bitter, and of course umami – and is impossible not to order every time that I go. It can be ordered as a soup if you so desire, but I find that eating it dry best captures the vibrant nature of the dish. If your only experience with Thai food is delivery from the same tired spot, it’s time to travel to Thai town and experience the real deal. Those fearful of strong flavors and lots of heat need not be afraid; most restaurants are happy to accommodate the Western palate. If you’re a fan of other Asian noodle soups like ramen, pho, or Taiwanese beef noodle soup, you should seriously consider adding boat noodles to the mix, even if you stay away from the organ meats. Be wary of starting at Sapp though, as few other bowls in the city will compare.